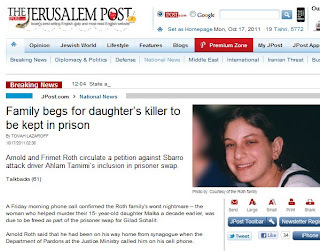 This Ongoing War: A Blog: 17-Oct-11: "The public has been given a false sense that there were no other options"
17-Oct-11: "The public has been given a false sense that there were no other options"
Arnold and Frimet Roth circulate a petition against Ahlam Tamimi’s inclusion in prisoner swap. 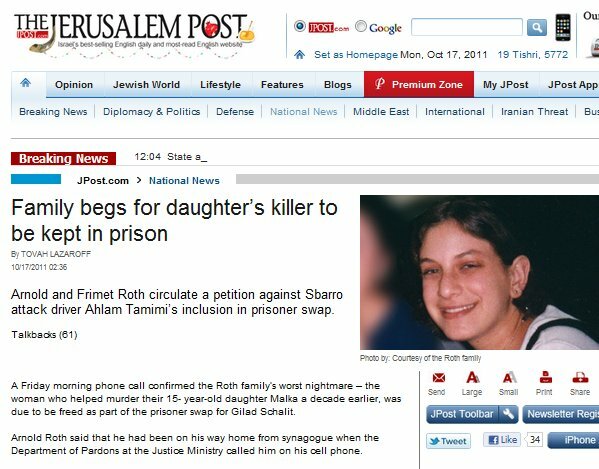 A Friday morning phone call confirmed the Roth family’s worst nightmare – the woman who helped murder their 15- year-old daughter Malka a decade earlier, was due to be freed as part of the prisoner swap for Gilad Schalit. Arnold Roth said that he had been on his way home from synagogue when the Department of Pardons at the Justice Ministry called him on his cell phone. The woman who spoke was “very nice and solicitous,” he recalled for The Jerusalem Post on Sunday. “She said, ‘I am very sorry to have to tell you this.’” Her words were shocking but not totally surprising. 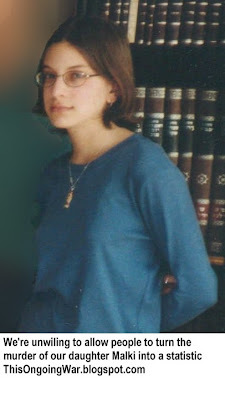 Both Arnold and his wife Frimet had already feared that Ahlam Tamimi, 31, who helped organize the August 2001 bombing of the Sbarro Pizzeria in Jerusalem, which killed 15 people including Malka, would be part of the prisoner exchange. Earlier this year Arnold and Frimet wrote a letter to Prime Minister Binyamin Netanyahu urging him to exclude her from the list. What was particularly upsetting, they both told the Post, was that Tamimi appeared to have known for years that she would be freed and had even told reporters this in 2006. Tamimi’s brother said the same thing and added that no terrorist serves out a prison term, Frimet said. “It is all so horrific,” she said. “Now, everyone knows that there is no justice here. You can murder and walk free. [Tamimi] knew this, years ago. Now she is free to do it again. Who is going to stop her?” asked Frimet. Although she and her husband have lobbied against Tamimi’s release for years, in the last three days they have embarked on a last-ditch public campaign to halt her release. Frimet, a native of New York, and Arnold, who is from Australia, have skipped the legal process in favor of a campaign that includes massive media interviews, the lobbying of Israeli politicians and a petition through which they are soliciting the signatures of supporters around the globe. Petitions, in this type of situation, “are an exercise in futility,” Arnold said. Instead he hopes to sway the “rational people at work in the government” to change their mind. “It is a naïve expectation, but we have picked up quite a lot of support,” he said. Since it was the government and public opinion that led to the deal, they are the ones that can change it, he said. Tamimi, he added, accompanied the suicide bomber and helped him with the explosive before escaping. On that summer afternoon, neither he nor his wife, knew that Malka, one of their seven children, was at the pizzeria. 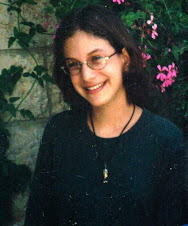 Malka had called her mother an hour earlier to say she was leaving the Jerusalem neighborhood of Ramot and heading to the neighborhood of Talpiot for a meeting of counselors from the youth group Ezra. Then there was a change of plans, and instead she and a good friend Michal Raziel, 16, who was also killed in the bombing, decided to stop downtown for pizza, Frimet said. “They were going to meet another friend who did not get there in time,” Frimet said. Initially, Frimet said, she feared more for some of her other children. But she said her concern for Malka grew after she could not reach her by phone for hours. Her fear heightened when she learned that Michal was also not answering her phone. They decided to check the hospitals and on the way learned that the two girls had gone to Sbarro’s and had never arrived at the meeting. “For a long time, no one would tell us for sure that she was dead,” said Frimet. It was only some 12 hours later that her body arrived at the morgue at Abu Kabir. They want to be sure that no other parents go through that experience at the hands of Tamimi, or any other terrorist that was freed as part of the prisoner exchange. The public has been given a false sense that there were no other options and that the only way to free Schalit was to do this deal, Arnold said. “I have had people yelling at me, ‘Do you want to see [Schalit] killed?’” Arnold said. “But it cannot be that a government has no options and decides to give in,” said Arnold, who moved to Israel with his family from Melbourne in 1988. “This is a campaign that is driven by the feelings that come upon you when your child is killed,” he said. “I do not feel that Malki is a partner in this. Postscript: Yediot Aharonot reports this morning that 79% of the Israeli public supports the terrorists-for-Gilad deal. Support among males is 74% while 86% of women support it.